"Through honesty and availability, we will strive for excellence for our owners, horses and ourselves." John's Comments - "By a great young stallion in Pierro, the ATC Golden Slipper, and is out of a half sister to Fastnet Rock and Cirque Du Soleil. 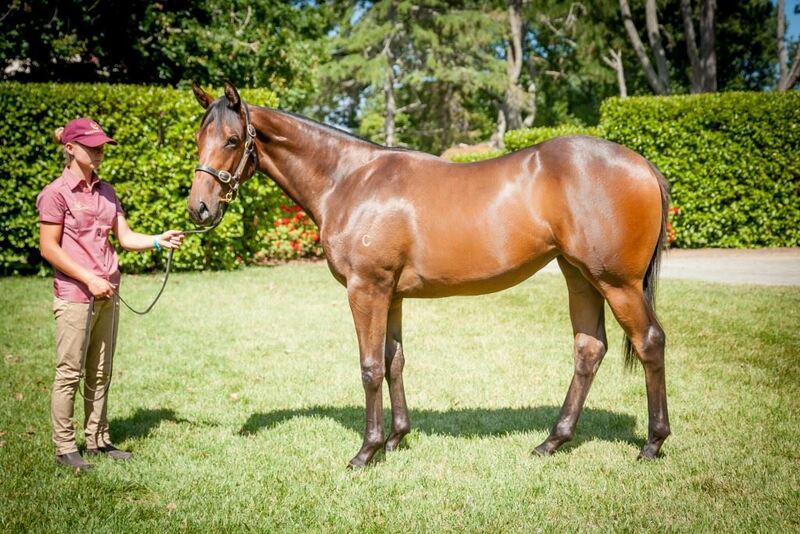 A strong walking filly which should make a lovely middle distance horse in time"
PIERRO (AUS) (Bay 2009-Stud 2013). 11 wins-6 at 2, ATC Golden Slipper S., Gr.1. Leading Aust. First Season Sire in 2016-17. Sire of 232 rnrs, 132 wnrs, 16 SW, inc. Levendi (ATC Australian Derby, Gr.1), Arcadia Queen, Pinot, Pierata, Action, Tulip, Bellevue Hill, Arcadia Prince, Regal Power, Furore, Roy Had Enough, Commander, I Like it Easy, Satin Slipper, Kentucky Breeze, Octabello, SP Sikorsky, Aeecee Tong De, etc. Delagos (g by Encosta de Lago) 8 wins from 1000m to 1600m, A$153,555, ATC Alea Acturial Consulting H.
Top Score (g by High Chaparral (Ire)) 4 wins at 1100m, 1200m to 2017-18, ATC Bowermans Furniture H., McGrath Estate Agents P., HKJC Sports Club Diamond Jubilee H., Incheon H., 2d HKJC Dorset H., 3d HKJC Ventris H., Chevalier E&M Engineering H.
California Archer (g by High Chaparral (Ire)) 3 wins to 1300m, A$54,000, HK$2,174,750, to 2018-19, ATC Pluck at Vinery H., HKJC Po Yee H., 2d HKJC Robin H., Sha Tin 40th Anniversary Cup H., Viva Pataca H., Riding for the Disabled H., 3d HKJC Kwoon Chung Jiangmen Express H.
Manasota (c by Dehere (USA)) 2 wins at 1200m, 1400m, ATC Coca Cola Amatil H., 3d ATC Big Brown First Crop H.
Chandana. 3 wins from 1400m to 1800m, A$169,400, ATC McGrath Estate Agents H., Pro-Ride H., Central Coast Football H., 2d ATC More Than Ready H., 3d ATC Tab.com.au H., Cellarbrations H., James Boags H., Everybody's Body H., All Too Hard at Vinery H., Schweppes H., Turf Club H.
Chapal. 2 wins at 1700m, 2400m to 2018-19, MRC Araza H., 3d VRC Make-a-Wish Aus Trophy H., SAJC AAMI H.
Gold Dragon. 2 wins at 1400m, 1600m, HK$2,167,200, HKJC Pansonic 4K IDTV H., Tamar H., 2d HKJC Fantastic Light H., Morse Park H., 3d HKJC Facial Ionic Steamer H., PT Bridal Collection H., Zenith Excellent H., Social Responsibility H., Absolute Champion H., On Lan H.
Galway (g Pierro) Winner at 1400m in 2018-19 in Aust. California Longbow (g by Pierro) 2 wins at 1400m, 1600m in 2018-19 in Aust. Rotterdam (f by Pierro) Winner at 1000m in 2017-18 in Aust. Calusa (f by High Chaparral (Ire)) Winner at 1600m in Aust. Crazyonyou (f by Encosta de Lago) Placed at 2, 2d ATC Goldners Horse Transport 2YO P.
FASTNET ROCK (c Danehill) Champion 3YO colt & sprinter in Australia in 2005. 6 wins to 1200m, A$1,724,100, VRC Lightning S., Gr.1, MRC Oakleigh P., Gr.1, VRC Lexus Classic S., Gr.2, AJC Up & Coming S., Gr.2, VRC Rory's Jester P., Gr.3, NSW Tatt's RC Roman Consul S., Gr.3, 2d AJC TJ Smith S., Gr.1, VRC Newmarket H., Gr.1, AJC San Domenico S., Gr.2, STC Pago Pago S., Gr.2, MRC Guineas Prelude, Gr.3, STC Skyline S., Gr.3, Crusoe's Fijian Retreat 2YO H., 3d AJC Sires' Produce S., Gr.1, VRC Poseidon S., L, 4th STC Golden Slipper S., Gr.1, Silver Slipper S., Gr.2. Champion sire. Emotional Circus (f Elusive Quality) 4 wins at 1100m, 1200m, A$281,550, Scone RC HTBA Protect Our Industry H., ATC Camden Hire H., New Breed Racing H., Flinders Lane Perfect Fit Shirt H., 3d ATC Premiere S., Gr.2, 4th ATC Sheraco S., L.
Twirl (f Lonhro) Placed at 2 & 3, A$85,695, 2d ATC Sweet Embrace S., Gr.2, TAB Iphone App 2YO P., Theraces.com.au H., 3d ATC Widden S., Gr.3. Han Xin - Sun Marshal (Sing.) (g Sepoy) 3 wins at 1600m, 2000m, A$131,725, S$79,275, to 2019 in Aust. and Singapore, MRC Jack Elliott H., 2d BRC Grand Prix S., Gr.3, 3d MRC Galilee Series Final H., L.
Distant Rock (g Medaglia d'Oro) 4 wins from 1400m to 1600m, A$182,080, SAJC IGA H., MRC Hilton Manufacturing H., 2d SAJC Adelaide Guineas, L.
Juggling Act. Champion Imported Horse in Philippines in 2011. 28 wins from 1100m to 2000m in Philippines, Philippine RC Diamond I S., Ambassador Eduardo M Conjuangco Jr Cup, Garnet I S., Opal S. Sire.